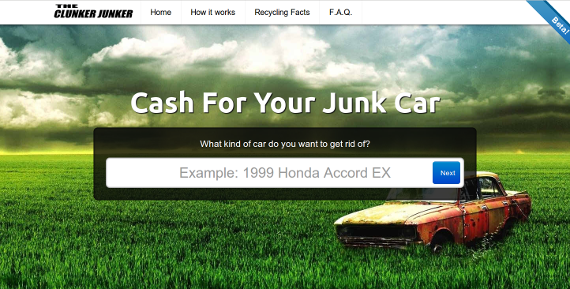 How Do I Sell My Junk Car? 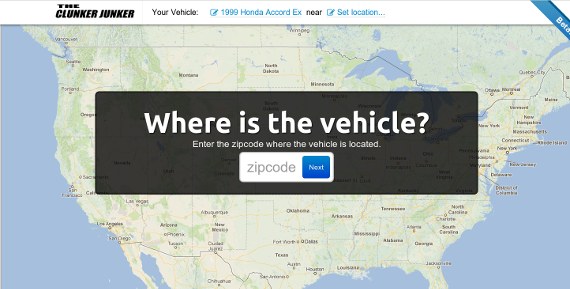 Tell us a little information about your vehicle and where it's located. In most cases our website will generate an instant offer within seconds. If you choose to accept our offer, one of our friendly junk car buyers in your area will reach out to schedule pickup. Once our offer is accepted one of our local carriers will reach out to you to schedule a convenient time for pickup. While we can not and do not guarantee any specific time frame for pickup, the vast majority of our vehicles are picked up within 1 to 3 business days of finalizing. When the carrier arrives, they'll do a quick inspection of the vehicle to verify condition. The carrier will exchange payment in the form of either cash or check for your vehicle. Towing is always free and there are no hidden charges. The offer you accept is the amount you are paid. At The Clunker Junker we know selling your car can be stressful endeavor, so we've set out to make the process as easy and straightforward as possible. Our goal is to solve all the biggest problems people face when trying to sell their used or junk cars to private parties on Internet classifieds sites like Autotrader or Craigslist. 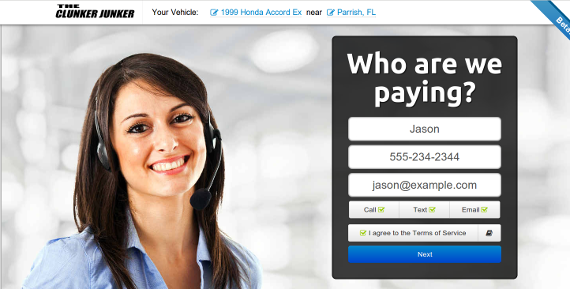 No more no-shows, tire-kickers, or potentially dangerous encounters while trying to sell your junk car. Our local junk car buyers are always friendly, reliable, and professional. How much money will The Clunker Junker pay me for my car? If the car is going to a salvage yard rather than auction, one of the most important factors that affect the value is how large the vehicle is and how much the raw scrap material is worth. A small Honda Civic will be worth more less than a large Chevy Suburban. However, many of our buyers do dismantle and re-sell parts, and so cars with a large market for replacement parts may also be worth more than cars that are more rare. What most negatively affects the value of your junk car or truck is its overall condition. A vehicle that does not start or drive will almost always be worth less than one that is working. This is because resale prices are higher, and knowing the parts on the car work and may be salvaged also improves the value of the car. Similarly if a vehicle has a lot of rust or damage from an accident, not only is the car more difficult to resell but there are fewer valuable parts left. 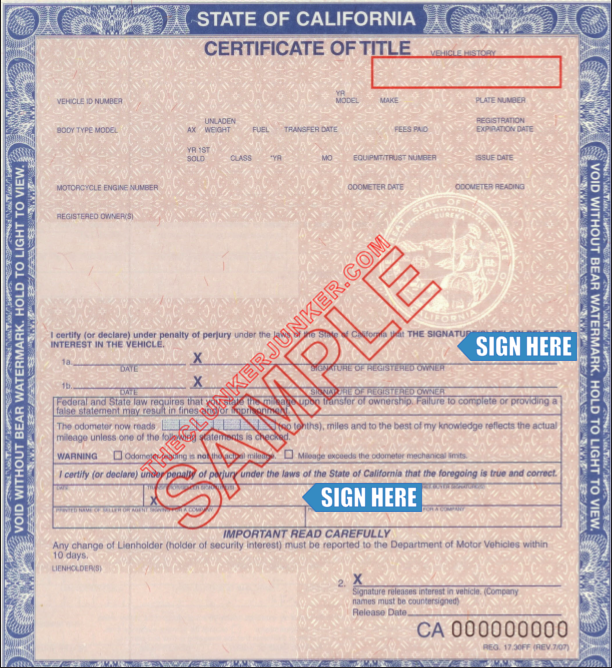 Vehicle titles are complicated and sensitive legal documents. The Clunker Junker has to be extremely careful when dealing with titles in all 50 states, as each state has specific rules and regulations about if and how a vehicle can be purchased without one. 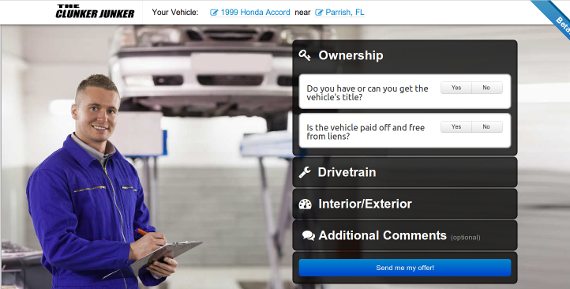 There is no direct answer to "can I sell my junk car with no title", so we encourage you to find your state in our service areas below where we have outlined if and how we can buy cars with no title in each state. If we can buy your car without the title, you almost always need some other form of proof of ownership. This is usually a photo ID matching a valid and current registration for the car, or in some states like Washington an "affidavit in lieu of title". We encourage you to reach out to us if you have any questions at all about how to sign your title or what is needed for us to purchase the car if you don't have one. What if I need my car picked up today? We totally get it, sometimes life is unpredictable and situations arise where you absolutely need to get rid of a car as soon as possible. Maybe the city is threatening to tow it away, or you're moving away and can't take the car with you. At The Clunker Junker we do our best to pick up junk cars as quickly as possible, but we can't always get everything on the same day. For most cars we buy, the local carriers manage their own pickup schedule and we don't have any involvement with scheduling or pickups, so we can't guarantee a time on their behalf. Even though we can't fully guarantee it, The Clunker Junker and our local carriers pick up cars on the same day all the time, all over the country. We strongly encourage you to submit your vehicle to us and give us a chance to pick it up same day. If after accepting our offer on your junk car scheduling does not work out, you are never under any obligation to complete the sale. Get and offer today and see what we can do! I will only accept cash for my car, not check! We agree there are a lot of really unsavory people in the junk and used car industries, and you should absolutely approach the act of selling your junk car with a huge amount of caution and skepticism. Being paid in actual "cash" for your car, rather than a check that is, is definitely the safest method of payment for you as a seller and we understand why you want to be paid that way. Unfortunately The Clunker Junker and our junk car buying partners can't always pay in physical cash. Buying cars from complete strangers can be as dangerous for us and our carriers as it is for you as the seller, so we also often have to protect ourselves. Having the tow truck drivers enter an unknown situation with large amounts of cash on their persons can put them in a lot of danger! Checks also help us keep a better paper trail of the transaction and can act as a form of proof of payment when cashed. For these reasons, you'll find that many cars we buy are paid by check rather than cash. When we say "Cash for cars", we are using the dictionary definition of the word cash, which is defined as cash money or cash equivalent, such as check, rather than something else like a voucher or tax credit. 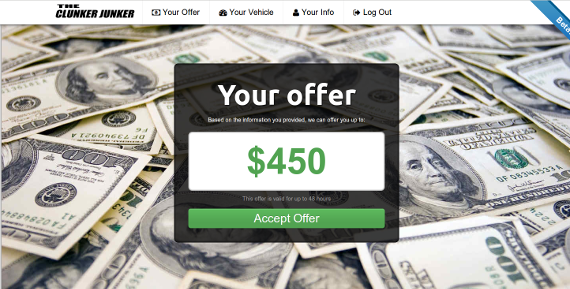 To help our sellers feel more at ease, The Clunker Junker offers a 100% payment guarantee. What that means is in the extremely rare case were a check from our carrier or local junk car buyer bounces or is otherwise invalid, The Clunker Junker will cover the payment out of our own pocket. 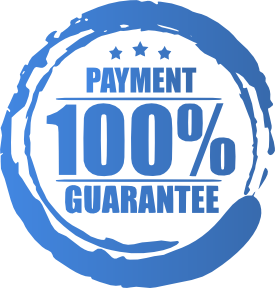 We have extreme confidence in our carriers and buyers, and having purchased over 40,000 cars we are proud to say we have never had an unresolved payment issue. Check our our Better Business Bureau rating and our positive online reviews!